It was an exciting week on the Kentucky Derby 2012 trail with Dullahan tagging Hansen in the Blue Grass and Bodemeister playing hide and go seek in the Arkansas Derby. I am not sure if unraced juvenile Bodemeister can win on the first Saturday in May but he certainly earned his shot under the Twin Spires with a dominating wire job tally in Saturday’s G1 Arkansas Derby. He reminds me of another unraced juvenile, Curlin. The latter also romped in the Arkansas Derby before finishing 3rd in the 2007 Ky Derby. Dullahan is a Keeneland freak, notching his second grade one win from as many starts in Lexington. He is winless in three tries at Churchill Downs and might have a difficult time duplicating his stellar late running victory on May 5. It was business as usual on the Kentucky Derby 2012 trail last weekend with favorites Gemologist and Alpha running 1-2 in the G1 Wood Memorial and highly regarded colts I’ll Have Another and Creative Cause noses apart in the G1 Santa Anita Derby. Done Talking upset the G3 Illinois Derby but that race was a puzzling crapshoot and should not have a major impact on the first Saturday in May. The more things change, the more they stay the same. Four of my top five contenders (Alpha, Secret Circle, Union Rags, Creative Cause) from my initial Derby Top 10 list last September are still very much in the thick of things, with Alpha, Union Rags, and Creative Cause running well without winning in their final Derby preps. Currency Swap and Midnight Transfer drop off the Exciting Prospects list after disappointing in graded action on April 7. There were surprises galore on the Kentucky Derby 2012 trail last weekend with Take Charge Indy going all the way in the G1 Florida Derby and 109-1 bomb Hero of Order stunning his rivals in the G2 Louisiana Derby. I recapped the G1 Florida Derby here on Sunday and in the video below. I have always liked Union Rags and am not going to abandon ship after a less than ideal trip behind tepid splits in his final Derby prep. Julien Leparoux could not do much after he committed to taking back early, coupled with getting pinned down along the inside by El Padrino’s rider Javier Castellano. Union Rags finished up nicely after finding room in the lane and almost caught Reveron for the place. He galloped out in front and horse/rider should move forward following that learning experience. In reality, he qualified for the Derby on graded earnings long ago, so Saturday’s race was meaningless from that standpoint. He remains a solid contender on the first Saturday in May as long as he trains well leading up to the big day. 3. Midnight Transfer (Hard Spun) – Ended up a respectable 3rd in his G2 San Felipe, his first start around two turns. He fired a 6f bullet at Santa Anita on March 30 and goes next in the G1 SA Derby on April 7. 4. Prospective (Malibu Moon) – Professional winner of the G2 Tampa Bay Derby (88 BSF) for Mark Casse. Blinkers helped him get involved earlier and he will face better next time in G1 Blue Grass. Breezed 5f in 1:01.20 (2/5) at Churchill Downs on 4-2. 5. Went The Day Well (Proud Citizen) – Followed in Animal Kingdom’s footsteps with a win in the G3 Spiral Stakes (92 BSF) for Motion/Team Valor. He was green in the stretch and might run one more time before the Derby, with the G3 Lexington Stakes at Keeneland on 4-21 a logical target. 1. Algorithms – Missed scheduled Fountain of Youth appearance with bone split injury and is off the Triple Crown trail. 2. B Shanny (Street Cry) – Ran twice in NY last summer including good looking maiden win over El Padrino at Saratoga Aug 20. Bone chip had him on the sidelines and he returned to the worktab on March 30, breezing 3f in :38.09 (16/22) at Belmont Park (training track). The winding road to Kentucky Derby 2012 took an unexpected turn in Louisiana on Sunday when 109-1 outsider Hero of Order shocked the world in the Grade 2 Louisiana Derby. As expected, longshot Comisky’s Humor shot to the early lead in the Fair Grounds showcase on Sunday with Hero of Order, Windsurfer, Cigar Street, and Mark Valeski chasing. The 26-1 early leader was done after six furlongs and bomber Hero of Order took over. Windsurfer was one paced along the inside and Mark Valeski started to advance turning for home. Hero of Order opened up a 1.5 length advantage and appeared to be saying come and get me…but nobody could. In the end, the Gennadi Dorochenko trainee held on by a 1/2 length under Eddie Martin Jr. with Mark Valeski settling for runner-up honors once again. The latter threw a shoe and bruised his foot during the race. Rousing Sermon was the only late runner to make an impact, checking in a solid 3rd under Mike Smith. 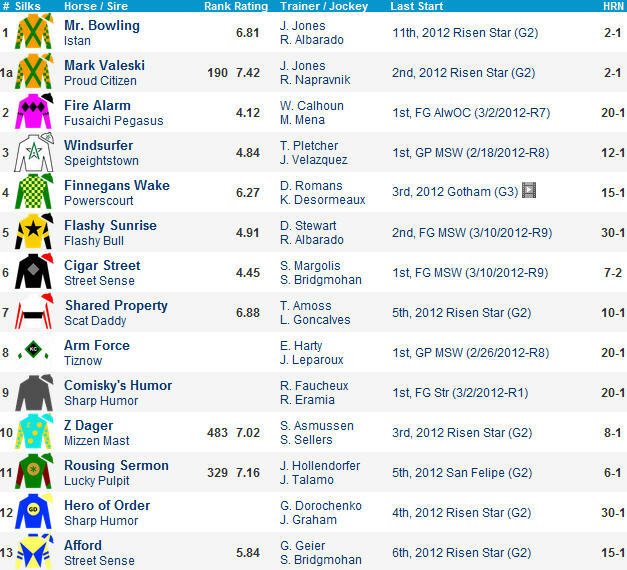 Cigar Street was 4th, followed by Shared Property, Windsurfer, Afford, Z Dager, Fire Alarm, Finnegans Wake, Flashy Sunrise, Mr. Bowling, and Comisky’s Humor. Hero of Order is not a Kentucky Derby nominee so he won’t be running under the Twin Spires on the first Saturday in May. The Fair Grounds Derby prep series proved disappointing with slow renewals of the G3 Lecomte and G2 Louisiana Derby. El Padrino and Mark Valeski put on a show in the G2 Risen Star but both failed to live up to expectations this weekend. I don’t think anybody coming out of this heat is a serious Derby threat. 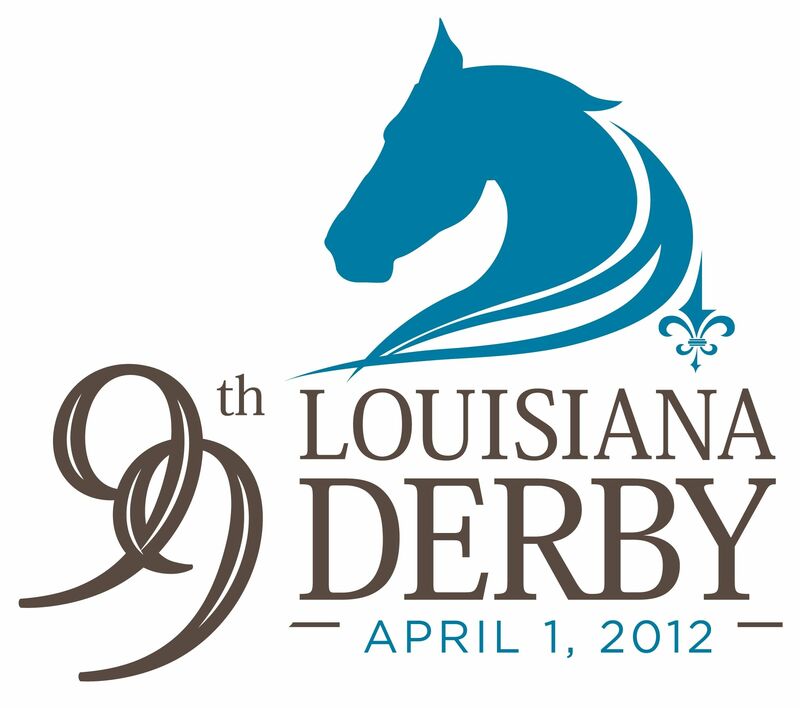 Louisiana Derby 2012 Preview: Is Mark Valeski the real deal? The Fair Grounds sophomores complete their Kentucky Derby 2012 road in Sunday’s Grade 2 Louisiana Derby and Mark Valeski tries to prove that he is a worthy morning line favorite. #7 SHARED PROPERTY (10-1) experienced wide trips in the G3 Lecomte (3rd from post 13) and G2 Risen Star (4th from post 10). He captured a Graded event as a juvenile, gets a much better draw (post 6), fired a local bullet March 19, and dons the hood for sharp trainer Tom Amoss. #3 Windsurfer (12-1) is on the upswing for Pletcher/Winstar Farm. The talented colt won despite a wide trip at the Gulf Feb 18 and was flattered when the runner-up returned to score. The $190k purchase fired a Palm Meadows bullet for this March 18 and projects an inner tactical trip under Johnny V. #1a Mark Valeski (2-1) did everything but win the G2 Risen Star. He stalked, pounced, and was nipped on the line by favorite El Padrino in his first route try for Larry Jones. The improving son of Proud Citizen should make his presence felt throughout under Napravnik.